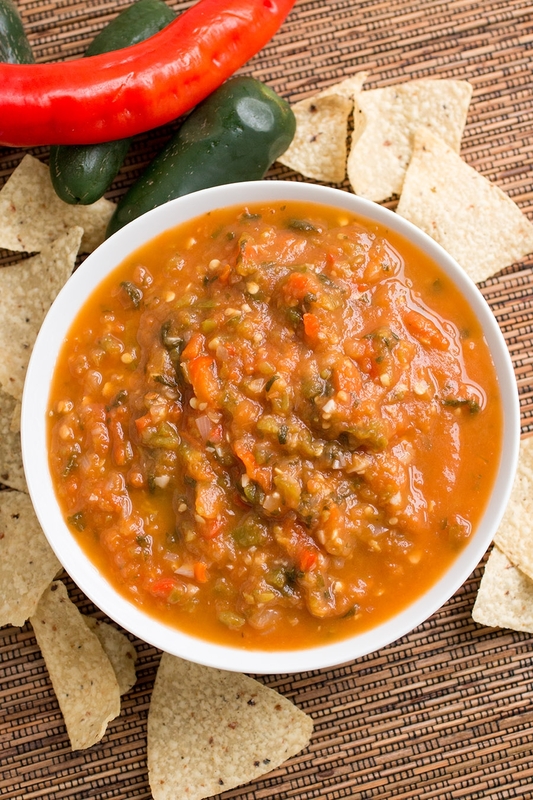 A recipe for sweet and spicy salsa made with fresh papaya, jalapeno, cayenne peppers and more. Sometimes all it takes for a recipe to come together is the inspiration of a single ingredient. In this case – the PAPAYA. As we were walking through the local farmers’ market, all manner of fresh foods found their way into our shopping bag. Chili peppers of all sorts, avocados, potatoes, tomatoes, Brussels sprouts, and a single super ripe papaya. Such a gorgeous fruit. Papayas are mild but slightly sweet, with the consistency of a ripe mango and an almost buttery texture. They aren’t quite as sweet as melon, and perfect for salsa, IMO. So! Papaya Salsa it is, my friends. Something simple and something super easy to serve up at a party or an impromtu gathering. Salsa is always a hit for parties, pretty much a no-brainer, and I should emphasize that salsa making truly is relatively easy to do. Salsa is essentially a mixture of chopped fruits and vegetables with other herbs and seasonings. From there you can serve it up fresh or cooked, blended or unblended. It all depends on the final goal you have in mind. This is a cooked down version, with everything tossed into a hot pan, then blended in a food processor. You can always make yours a bit chunkier by processing only half of the mixture, or only processing it a little bit. Or, go as smooth as you’d like. Even consider adding a bit of water for more of a table sauce. Either way, it tastes great! Look at the consistency. I want to dive right in there! Patty’s Perspective: LOVE this stuff. This salsa was so flavorful and unique that I wanted to keep it all to myself and make it my dinner. We served it as an appetizer. Too bad there was all this other great food coming! So, I had to share. Heat a pan to medium heat and add olive oil. Add onion and chili peppers and cook about 5 minutes to soften. Add garlic and cook another minute, stirring. Add papaya, tomatoes and cilantro. Stir and cook about 5 minutes to soften everything. Add vinegar and salt. Reduce heat and simmer about 15 minutes. 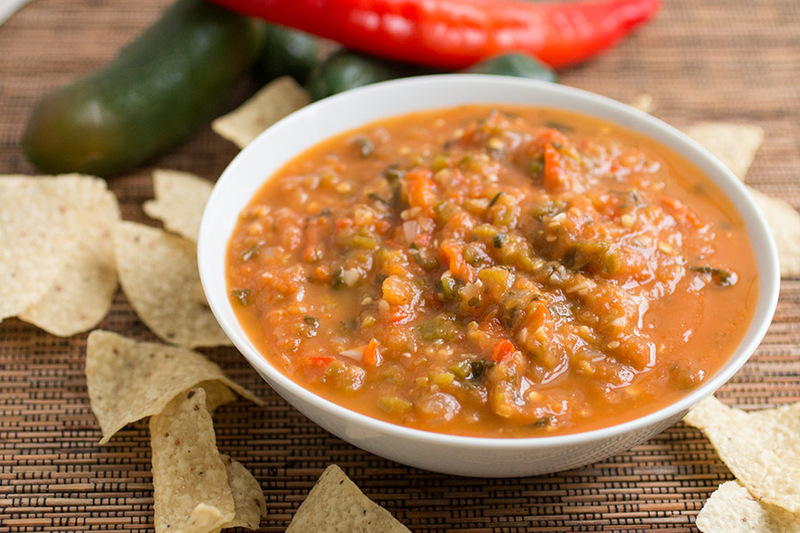 Transfer the batch to a food processor and process to form your salsa. It can be as thick or thin as you’d like. Adjust for salt and cool. Awesome, Michelle. Thanks! Super happy you enjoyed it! REPLY: Whitlyn, it is best to use ripe papaya. — Mike from Chili Pepper Madness. OMG, what a beautiful sight. A feast for the eyes as well as the tummy. I can almost taste it. I don’t know when they are ripe and ready to use. I am absolutely going to try to make this salsa. And now, with your permission, I am going to explore your site.